Smartphones, tablets, computers – screens are everywhere, and they can get really addictive for our kids, whether it’s social media, games, or all that YouTube that takes up their time. 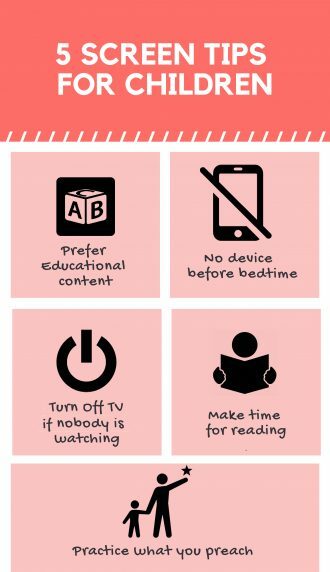 Here are some tips to help manage your child’s screen time and keep their eyes from being glued 24/7. If your kids are going to be glued to a screen, might as well make it something useful. Download educational apps for their devices and encourage them to learn from them. There are plenty of fun and engaging learning games out there that can teach arithmetic, programming, and history. On top of that, there are lots of very educational YouTube channels that can teach a variety of subjects in very accessible formats. The blue light from these devices affects our circadian rhythms. Tell your kids not to use any screen an hour before bedtime, and keep the devices away from bedrooms to avoid any sneaky nighttime use. Having a TV on mindlessly isn’t just a waste of electricity, it also encourages being stuck in front of the screen, even if nothing is going on – totally unproductive! Turn off TVs and computers when they’re not in use. If possible, place TVs in cabinets whose doors can be closed – a TV that’s turned off gives off a sense of something being missing. Reading and watching movies can be a great family bonding activity, so even if there’s a screen involved, at least it’s together. You can talk about what you’re watching together, discuss themes, and even ask their opinions about it. Kids are impressionable creatures, and if they see you always on your phone or on the TV, they’re going to end up just like you. Practice what you preach, and make sure that you too limit your screen time and spend more time with them!